In mid-1980s Chicago, gallery executive Yale Tishman tries to help an elderly woman stage an art show that includes her obscure lover. Thirty years later, Fiona Marcus, connected to Yale through her long-deceased brother Nico, sets out to find her missing daughter Claire in Paris, last seen living as part of a Colorado cult. Makkai’s third novel is a tour-de-force exploration of a group of friends during the AIDS crisis, and how the epidemic casts its shadow more than a generation later. Like so many other novels I’m drawn to, it’s also about the legacy that parents pass on to their children. It's a story that draws guffaws in one moment and tears in the next and captures the friends-are-your-family ethos that was such an important part of LGBT culture. The Windy City setting is spot on too. One of my favorite novels of the year. 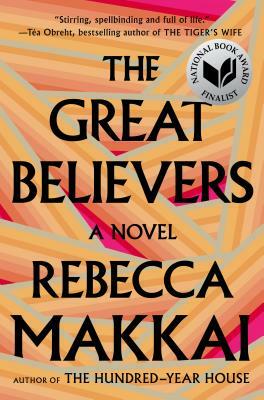 The Great Believers is the kind of book that reminds me why I love reading in the first place, a book that lets you live a part of someone else's life. It's the kind of book that throws open the door of a world and welcomes you inside. It's about Yale Tishman in Chicago in the 80s, as his art world career begins to take off, watching his friends - his family (one genius conceit of the novel is the family saga structure Makkai uses to tell these friends' story) - decimated by the AIDS crisis during its American height. And there's a second storyline, 30 years on, as Yale's dear friend Fiona searches for her runaway daughter in Paris, pulling old friends back into her orbit as she comes to terms with the toll of losing those closest to her decades before - there's a devastating understanding in this book that the damage of PTSD comes from more than one kind of war. This is a beautiful, heart wrenching, and true novel.